There is nothing more relaxing and thrill seeking at the same time than horse riding. You can trot along slowly and take in the views around you or for the more experience, you get to feel that rush of excitement as the horse gallops along the sandy beach. Island View Riding Stables is a family-run horse farm who specialise in beach rides in Sligo and Donegal Bay. 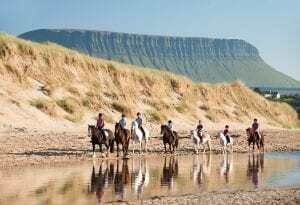 Riding on the beach is a bucket-list item for many of us, tick it off when you visit Sligo! It’s rare you can experience something as authentic as riding a horse along the breath-taking west coast of Ireland, feeling the sea breeze brush past your face. This horse farm offers many different options for beginners and experienced riders alike. They have trekking options ranging from a 30-minute trek that is led by a rein (suitable for young children), 1 hour beach rides to a full day trail riding. The pace is also tailored per person’s ability. You choose which packages would suit your level the best. Well-mannered horses and ponies, spectacular scenery and experienced, friendly staff ensure that everybody has the time of their life on horseback! Clayton Hotel Sligo is only 20-minute drive from Island View Riding Stables and it is well worth it. All that exercise and sea air will certainly build up an appetite. The hotel serves delicious food offerings for breakfast (including the healthy Vitality breakfast range) and dinner so you can your family can fill up before and after on good, wholesome food. Make your dreams come true and horse ride along a beautiful sandy beach.